* To identify your iPhone model number, see https://support.apple.com/en-gb/HT3939. For details on LTE support, contact your carrier and see www.apple.com/uk/iphone/LTE. Mobile technology support is based on iPhone model number and configuration for either CDMA or GSM networks. 1. Available space is less and varies due to many factors. A standard configuration uses approximately 10GB to 12GB of space (including iOS and pre-installed apps) depending on the model and settings. Pre-installed apps use about 4GB, and you can delete these apps and restore them. 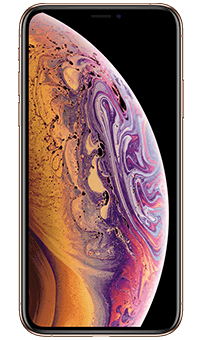 3. iPhone XS and iPhone XS Max are splash, water and dust resistant and were tested under controlled laboratory conditions with a rating of IP68 under IEC standard 60529 (maximum depth of 2 metres up to 30 minutes). Splash, water and dust resistance are not permanent conditions and resistance might decrease as a result of normal wear. Do not attempt to charge a wet iPhone; refer to the user guide for cleaning and drying instructions. Liquid damage not covered under warranty. 4. Data plan required. Gigabit-class LTE, 4G LTE Advanced, 4G LTE, VoLTE and Wi?Fi calling are available in selected markets and through selected carriers. Speeds are based on theoretical throughput and vary based on site conditions and carrier. For details on LTE support, contact your carrier and see www.apple.com/uk/iphone/LTE. 5. FaceTime calling requires a FaceTime-enabled device for the caller and recipient and a Wi?Fi connection. Availability over a mobile network depends on carrier policies; data charges may apply.6. Standard Dynamic Range video content only. 9. 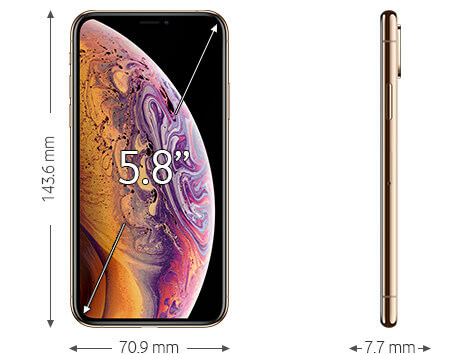 Testing conducted by Apple in August 2018 using pre-production iPhone XS and iPhone XS Max units and software and accessory Apple USB?C Power Adapters (30W Model A1882 and 87W Model A1719). Fast-charge testing conducted with drained iPhone units. Charge time varies with environmental factors; actual results will vary. 11. eSIM will be available later this year through a software update. Use of eSIM requires a wireless service plan (which may include restrictions on switching service providers and roaming, even after contract expires). Not all carriers support eSIM. Use of eSIM in iPhone may be disabled when purchased from some carriers. See your carrier for details. To learn more, visit https://support.apple.com/en-gb/HT209044.